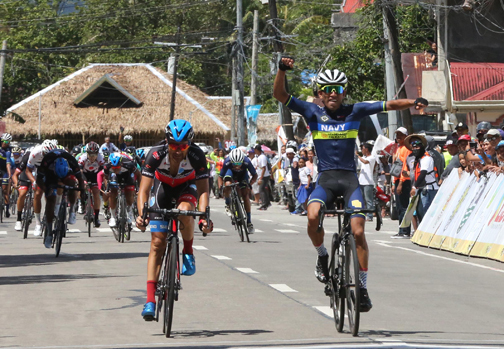 Pandan, Antique—Spanish rider Francisco Mancebo Perez celebrated his first overall win in four years by taking the individual general classification honors after five stages of the LBC Ronda Pilipinas 2019 here. Standard Insurance-Navy’s El Joshua Carino (right), the 2018 Le Tour champion, bested reigning Tour de Langkawi champion Artem Ovechkin to claim his first stage win of this UCI-sanctioned race. Mancebo, who last did it in the Tour of Jalajah in Malaysia back in 2015, stayed way back in the third bunch of riders to finish 32 seconds behind stage winner, Navyman El Joshua Carino when he reached the finish line after 148.9 kilometers. “It was a hard race. There were problems with some flats, and it was fast (the race),” said the 42-year-old Tour de France veteran, who was heavily guarded by dethroned champion Ronald Oranza of the Philippine Navy-Standard Indurance. Carino took advantage of the rolling terrain in Ibajay and went straight to the finish line, towing a 33-man group with him at the race ended in front of the Panday Bay Institute finish line 3:24.37, with Terangganu riders Artem Ovechkin and Mohd Harrif taking second and third, respectively. “Ang plano ay umatake si (Ronald) Lomotos sa KOM kasi siya iyung may puntos. Pero kinapos, kaya pumasok ako bilang reserba,” said Carino. With Lomotos unable to take charge in the King of the Mountain portion 30.7 kilometers into the race, it was up to Carino to fend an attack coming from Ovechkin and Marale-Erdene Batmunkh, who were second and third in the KOM race. Carino was done yet. He towed Filipino riders Jan Paul Morales and 7-Eleven’s Dominic Perez in the downhill dash towards Pandan. And this earned Carino the best Filipino rider honors for the stage. Oranza, who placed 10th in the stage, was three minutes and 20 seconds behind Mancebo-Perez in the overall individual rankings, followed by Perez and Morales. Terangganu claimed the overall team honors, followed in second and third 7-Eleven and Navy. Perez, who was fifth in the stage, was also in the main group with Navyman Rudy Roque and Go for Gold rider Elmer Navarro.